LONDON, June 19 -- British Prime Minister Theresa May said on Monday that she would chair an emergency meeting later in the day after police called the incident in north London "a potential terrorist attack." At least one person was killed and 10 others were injured when a van was driven into worshippers early morning on Monday near a north London mosque in what police have called a "major incident". 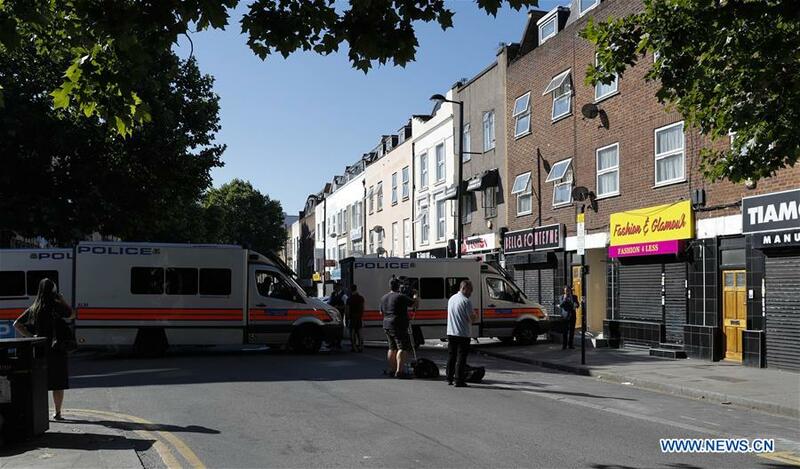 Police said the incident took place near Finsbury Park Mosque in Seven Sisters Road. A van driver who was arrested by police has been taken to hospital and is subject to a mental health assessment. Describing it as a "terrible incident", May said: "All my thoughts are with those who have been injured, their loved ones and the emergency services on the scene." She was later due to chair a meeting of the national Cobra emergency meeting to discuss the latest attack. Meanwhile, mayor of London Sadiq Khan pleaded for calmness, urging people to remain vigilant. In a statement issued by city hall, Khan said: "We don't yet know the full details, but this was clearly a deliberate attack on innocent Londoners, many of whom were finishing prayers during the holy month of Ramadan." "While this appears to be an attack on a particular community, like the terrible attacks in Manchester, Westminster and London Bridge, it is also an assault on all our shared values of tolerance, freedom and respect," he said. Home Secretary Amber Rudd said: "I am in contact with the Metropolitan Police (Met) who have confirmed it is being investigated by their Counter Terrorism Command. We must all continue to stand together, resolute, against all those who try to divide us and spread hate and fear." The incident came weeks after three Islamist radicals rammed a van into pedestrians on London Bridge before rampaging through Borough Market with knives, killing eight people before being shot dead by police. "The driver of the van -- a man aged 48 -- was found detained by members of public at the scene and then arrested by police in connection with the incident," the Met Police said in a statement, adding that investigation is being carried out by the Counter Terrorism Command. The Evening Standard newspaper said the "rented" van swerved onto the pavement on Seven Sisters Road shortly after midnight. A man was then said to leap out of the vehicle, and unconfirmed reports say at least one of the victims was stabbed. The newspaper said the arrested man is "white with black hair." Many of the victims are believed to have just left evening prayers after breaking the Ramadan fast. "One man was pronounced dead at the scene, eight people injured and were taken to three separate hospitals and two people were treated at the scene for minor injuries," said the Met. However, it said at this stage there are no reports of any people having suffered any knife injuries. Witnesses described how the driver of the vehicle shouted "I want to kill all Muslims" as the vehicle mounted a sidewalk and ploughed into a group of worshippers as they left a welfare center at the mosque where Muslims had just broken their Ramadan fast. One man who managed to escape said he had to jump clear as the van started to strike people. "He just came into all of us. There was a lot of people. I was shocked, there were bodies around me. Thank God I just moved to the side. I just jumped," said the man. One eyewitness who lives in a flat on Seven Sisters Road told the BBC she saw people "shouting and screaming". "Everyone was shouting 'a van's hit people'," she said. A large area around Seven Sisters Road where the attack happened was sealed off by counter terrorism officers. London Ambulance Service deputy director of operations Kevin Bate said: "We have sent a number of ambulance crews, advance paramedics and specialist responses teams to the scene." "We are working closely with other members of the emergency services at the scene. Our priority is to assess the level and nature of injuries and ensure those in the most need are treated first and taken to hospital," he said. The police investigation into the incident is being carried out by the Met's Counter Terrorism Command. "At this early stage of this investigation, no other suspects at the scene have been identified or reported to police. However, the investigation continues," said the police. "Due to the nature of this incident, extra policing resources have been deployed in order to reassure communities, especially those observing Ramadan," it added. The British Council of Muslims called for extra security around mosques, saying the late night attack was a violent manifestation of Islamophobia. It was the third attack in London since March in which vehicles were used as an attack method, following attacks on Westminster Bridge and London Bridge.